Attention U.S. TCM Subscribers: Italian director Vittorio De Sica's neo-realist masterpiece Bicycle Thieves (Ladri di biciclette) is one of the most emotionally devastating films of all time. No amount of superlatives can possibly describe the spiritual rewards one gleans from witnessing this simple but profound odyssey taken by a father and his dutifully loving son while desperately searching for a stolen bicycle. The search begins on Monday, February 4 (late evening) at 2:30am PST. 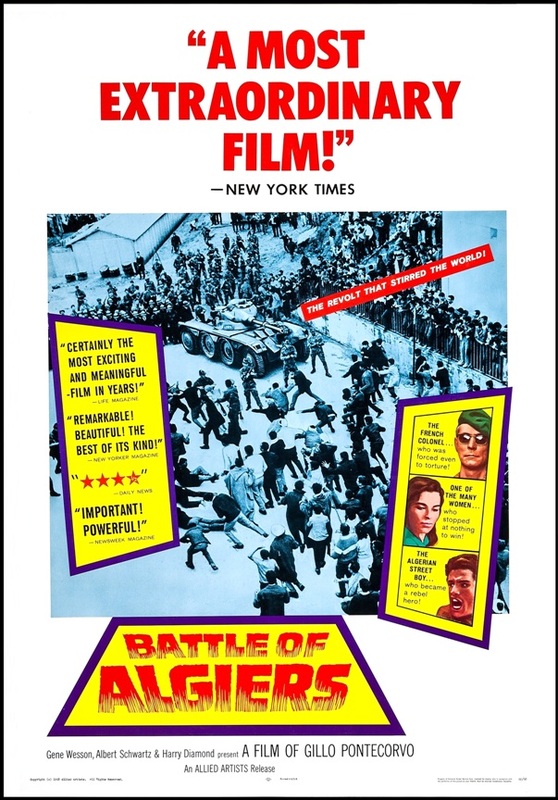 Like the film recommendation above, there will follow another of our Top Ten World Cinema Treasures, The Battle of Algiers (La battaglia di Algeri). The intensity of resolve and emotional dedication is so resolute on both sides of the conflict portrayed, it'll take a miracle for the invested viewer to fully recover after witnessing this stunning cinematic spectacle. The battle will commence Tuesday, February 5 at 11am PST. It doesnt usually follow but i hope we get these on uk tcm soon then. I've bought The Battle of Algiers (the film) at least three times on video, DVD and bluray. A second iteration is available on bluray, which JUST falls below the threshold of another dip, but if it were available on 4k, I wouldn't hesitate. I think I've seen BATTLE OF ALGIERS all but once, but THE BICYCLE THIEVES I've seen many times after I was first introduced to it during film studies in the year 2000. My favourite Italian neorealist (and De Sica) film remains UMBERTO D, however. I've never seen The Bicycle Thieves either, though I'd like too. It rarely seems to crop up on TV, from what I see. I have a copy of The Battle of Algiers on DVD (I finally managed to get the score when Quartet issued it a few years ago). We seem to get totally different films on TCM here in the UK, as a lot of the films posted by Arthur on his "Attention" threads never seem to show over here. They do Thomas ...we're just 19 months behind!!! Ha ha. It's just like the 80s all over again!! 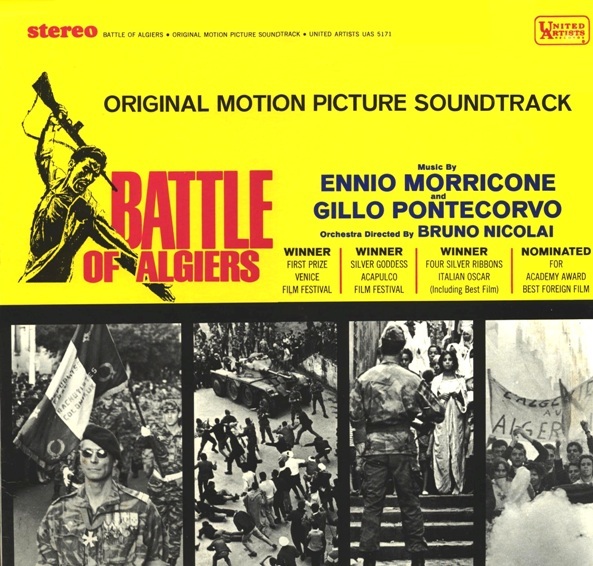 BATTLE OF ALGIERS was nominated for an Oscar as Best Foreign Language Film in 1966, and then was a nominee for Best Screenplay and Best Direction in 1968. Because of its contentious pro-Algerian politics, the film wasn't released in France until 1971. The only professional actor in the film is Jean Martin as "Coloniel Matthieu". Director Gillo Pontecorvo wanted at least one professional actor, particularly in that pivotal role. The two argued frequently on set as Pontecorvo was trying to reign in Martin so that his performance would lie better with those of the non-professionals. Such was the realistic nature of the pseudo-documentary filming, the movie was released in the USA with a disclaimer that not one foot of newsreel was used. Director Gillo Pontecorvo originally composed the score for the film but was later persuaded to use a more conventional score. Thus, Ennio Morricone was brought in. Pontecorvo and Morricone had regular disagreements over the score. At one point, Pontecorvo had a melody stuck in his mind which he desperately wanted as a theme in the movie. He went to Morricone's apartment to play it for him, and hummed the tune all the way up to the top floor. Then Morricone asked him to wait with the tune, since he had conceived a melody of his own. To Pontecorvo's surprise, the tune was exactly the same as the one he had in mind, and he was delighted to find out that after all those months of struggling, they had finally found something, separate from each other, on which they could agree. It wasn't until months later at the Venice film festival that Morricone admitted that he had pulled a prank on him; he had already heard Pontecorvo humming the song while coming up the stairs, and decided to pretend he had come up with the same melody himself.